TODAY’S NEW ENGLAND anglers enjoy a tremendous variety of options. Our coldwater streams and lakes abound with self-sustaining populations of European brown trout and western rainbows, often happily mingled with smallmouth bass and northern pike. Our warmwater ponds and lakes hold southern interlopers such as bluegills and largemouth bass. Our coastal waters teem with migratory striped bass and bluefish. There’s something for everybody, and most of us treat it like a buffet and sample everything. We’ve got lot of good fly fishing to choose from. But buried deep in the marrow of most New Englanders runs a powerful strain of traditionalism. We are proud of our roots. We cherish the Good Old Days. The Good Old New England angling days focused on brook trout and Atlantic salmon, the only salmonids native to our waters. At the end of the last ice age, when retreating glaciers barricaded anadromous fish from the ocean, the salmon adapted, became landlocked, surviving in the headwaters of what had been four oceangoing rivers. When the 19th century industrialists built dams on virtually all the running water in the six states, more landlocked fisheries were born. Meanwhile, native brook trout populations dwindled but did not disappear. They remain still in northcountry lakes and rivers and backwoods ponds and streams. These fish are direct descendants of the “squaretails” (as we call them) that thrived here eons before the Pilgrims landed in Plymouth. We New Englanders value our native fish. We are stubborn and chauvinistic. We are determined to keep our traditions alive. And so we bushwhack into boggy beaver ponds and troll streamers around the rims of big Maine lakes, the way our fathers and grandfathers did. Over the years, New Englanders have created and adapted scores of fly patterns for our native brook trout and landlocked salmon. Some of them are old and others have been hatched more recently. They all still work as well as ever, and many of us prefer to use them. They do just fine on out-of-state fish like rainbow and brown trout too. 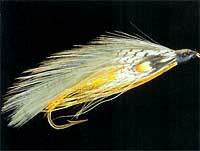 Probably the most famous of all featherwing streamers, the Grey Ghost is still number one among those who troll flies on Sebago and Moosehead and other big lakes for landlocked salmon and squaretails. Carrie G. Stevens (who didn’t use a vise) tied the world’s first Grey Ghost on July 1, 1924, to imitate the smelts that were (and still are) the primary forage of salmonids in coldwater lakes. That same afternoon, she tied her new creation to her leader, cast it into the Upper Dam Pool near her home on Lake Mooselookmeguntic, and caught a 6-pound-13-ounce brook trout. The fish won second place in the Field & Stream annual fishing contest and everlasting fame for Mrs. Stevens and her Grey Ghost streamer. 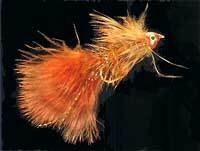 The Dark Tiger was my father’s favorite bucktail for both salmon and trout, and inevitably it became my favorite, too. Dad tied scores of Tigers every winter for us and his friends — trout-size ones for brookies in small streams and beaver ponds, and longer ones to troll and cast for salmon, togue (lake trout), and squaretails. 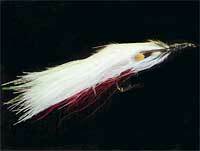 Dad believed the Dark Tiger was the only bucktail anyone would ever need, and it was just about the only one he ever used. It was invented by William R. Edson of Portland (Maine, of course) in 1929. A. W. Ballou, of Litchfield, Maine, is generally credited with being the originator of the marabou streamer, and his Special, which he created in 1921, was the first one. Ballou’s original Special makes an excellent smelt imitation, which is what he intended. It quickly became a favorite of the salmon fanatics who trolled flies around the mouth of the Songo River on Sebago Lake, where the smelts gathered for their spring spawning ascent. More important, the Ballou Special inspired uncountable numbers of fly patterns and designs featuring marabou. Sculpins abound in the tumbling, boulder-strewn rivers of northern New England and are the number-one forage for big river-dwelling brook trout and landlocked salmon. Outfitter Rick Estes, who calls New Hampshire’s brawling Androscoggin River his home water, gives his localized version of the Woolly Bugger a bushy tail and a heavy conehead to go deep and tumble along the bottom the way weak-swimming sculpins do. Downeaster Jack Cooper invented this simple deer-hair bug back in the 1930s to catch the brook trout that gobbled caddisflies off the surface of his local ponds. The fly worked so well that Cooper applied for a patent. He was denied on the grounds that his bug was too similar to Orley Tuttle’s Devil Bug. Bob Elliot, for decades the official spokesman for Maine’s angling tourism and an expert on eastern brook trout, gave a handful of Cooper’s bugs to my father. Dad gave ’em a try and declared the Cooper Bug his favorite all-round searching fly. We fished them dead-drifted upstream, both to rising trout and to likely pockets. We cast them down and across and twitched ’em back. We caught a lot of brookies both ways from the streams we floated in Dad’s canoe. Most New England rivers and streams are relatively sterile. They produce sparse mayfly hatches, although they do harbor a great number of species. You never know what mayflies you might find hatching on brook-trout water, but luckily, the fish can’t afford to be picky, and precisely imitative flies aren’t needed. My father, a pragmatic Yankee, concluded that size and presentation made all the difference, and he thought it was a waste of precious fishing time to keep trying different patterns. So about 50 years ago he invented the Nearenuf, and most of his fishing partners (including me) adopted it and found that it worked. The Nearenuf imitates no particular mayfly perfectly… but it’s, um, near enough to most New England mayflies to catch any trout that are eating them. This large caddisfly swarms in streamside bushes in June (at the height of the New England blackfly season). The alderfly is the biggest hatch of the year on rocky brook-trout rivers such as the Androscoggin. In fact, according to Rick Estes, it’s the only hatch that dependably brings every trout in the river to the surface to feed. Estes’s Alderfly imitation combines the distinctive profile of the deltashaped wing with the high flotation of a palmered body. Casting down and across and twitching the fly across the currents (“skittering” we call it here in New England) brings trout slashing and boiling when they’re up on alderflies. Of course, Estes’s delta wing Alderfly, in various sizes and colors, does a good job any time trout or salmon are taking caddisflies on top. 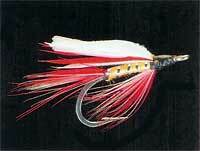 Nobody knows who was the first angler to wrap a feather around the shank of a hook and catch a trout with it. 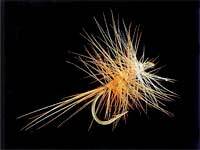 The “palmer fly” goes all the way back to the days of Charles Cotton, who made them in many colors and believed they imitated caterpillars. 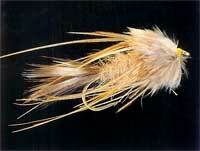 The bivisible is simply a palmer fly with a turn of white hackle in front so the angler can see it easily. We New Englanders use it for probing pockets and riffles in fast-moving little brook-trout streams and as a generic caddisfly imitation. It floats forever, skitters nicely, and is easy to see. You’ll have to ask the trout what they’re thinking when they eat it. Probably not a caterpillar. Jack Gartside, the legendary Boston fly tier, cabdriver, and raconteur, has been experimenting with fly-tying materials and coming up with entirely new designs and concepts for 40 years. Among his revolutionary inventions are the Gurgler and the Soft-Hackled Streamer. The Sparrow Nymph is one of his earliest designs, and it has stood the test of time. The Sparrow is the nymph equivalent of the Nearenuf. It’s buggy and suggestive and works just as well twitched in a pond as it does dead-drifted in a stream. Big ones suggest stoneflies; tiny ones imitate midge pupae. All the in-between sizes are, well, near enough to whatever mayfly nymphs are available.